In 1970 the Media Centre was moved to the St. George campus. I gave up my academic appointment at the English department and accepted the non-academic appointment of executive producer in charge of a production staff of six. In 1983, owing to fiscal restraints in the university, the Media Centre was disbanded. I and my senior producer, Bill Somerville, went on to form Bellair Communications, a successful educational and documentary film and television production company. Bill later left to become director of Broadcast and Recording Services at the Legislature of Ontario. I stayed on as president of Bellair until early retirement in 2000. Two projects have engaged me since that time. Writing is one. I have published several articles and short stories, and written three (as yet unpublished) novels. 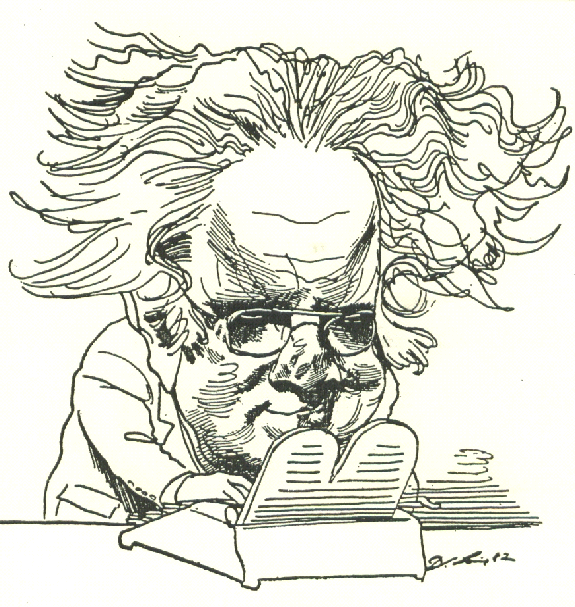 The other is the Northrop Frye project. Since 2005, I have been negotiating, through Bill Somerville’s and my new company, ARCHIVEsync, for rights to use the archived Frye videos in our proposed twenty-four part DVD series—current working title, Archetypes: Northrop Frye on the Bible and Literature. It seems incredible that five years have passed since our original bid for a license to use the Frye videos in our project. Yet it is understandable. As mentioned earlier, policy for dealing with TV materials–reflected in all standard letters of agreement between the university and individual professors (a policy which I had a hand in drawing up)– gave professors the right of approval as well as a veto. As executor of Northrop Frye’s estate, that right is now vested in Victoria University. Copyright, however, is vested in the U of T, which means in practice the repository of the Frye videos, the Robarts Library. It is not hard to see where difficulties enter in. But this is only a small part of the challenge. Copyright law about digital data (in Canada and the world) is in disarray. The internet bristles with imponderables for libraries in matters of compensation and free access. In our situation we found it difficult to demonstrate to the satisfaction of the university representatives what exactly our product would look like. So we proceeded at our own expense to produce a DVD prototype of Program One. This issued finally in a key meeting attended by Carole Moore (Robarts’ chief librarian), Michael Edmunds (director of Information Commons, successor to the old Media Centre), Gillian Pearson (Executive Secretary to the President, Victoria University), and Paul Gooch (President of Victoria University). Between 2005 and today I have accumulated a hefty correspondence file with the university parties involved. I had one face-to-face meeting with Paul Gooch and Gillian Pearson four years ago. Bill and I had had three meetings with Carole Moore and Michael Edmunds over the past two years. And then there was the key meeting, February 9, with all four principals in attendance for the first time. They had all seen our prototype DVD and had some comments. Where were the clearances for the stills we had used? Bill pointed out that this was a demo, not a marketable product, and that having spent 30 years in the business he was aware he would have to budget for and pay for sound and picture clearances. Some discussion took place regarding financing and royalties. I emphasized that we required no financial support from the university. On the contrary, we would pay the university a fair royalty from sales to be used hopefully for the establishment of a Northrop Frye Bursary Fund. But until we had at least a conditional letter of intent to license our use of the archive videos, all we could do is create a budget, set up a business plan, and wait. We have done that. But no money will be forthcoming until we have a licensing agreement to use the archived video. The chief concern at this crucial meeting was voiced by President Paul Gooch. He worried about quality control. What if what we produced did not meet top industry standards, in terms not just of content but of technical excellence. We were sent away to propose the terms and conditions we sought for a licensing agreement. In our proposal we responded to President Gooch’s concern by agreeing that the university would have final approval of every program in the series prior to its release. It has been a long slog. One thing at least has been accomplished. Not through design but through inadvertance, the Frye video archive (some 300 chunks of 20 minute analog tapes we produced) has gathered dust for 30 years. Every TV network now recognizes that their old analog tapes are becoming demagnetized over time and will eventually become indecipherable. Information Commons too, is attempting to convert magnetic tapes to digital as time and money allow. Our agitation brought Frye to the forefront of attention of Information Commons and they have now digitized the entire raw video archive of Frye, and so preserved it … for eternity? Strangely, two days later, a draft Licensing Agreement from the university landed in my mail. After five years of walking, now we can run. All we need now is a lot of money. We have already begun working on that and will friends of Frye informed here as events unfold.